You would think that after three years of non-stop LTE rollouts a good hunk of the globe would now fall under the 4G umbrella. Well, think again. 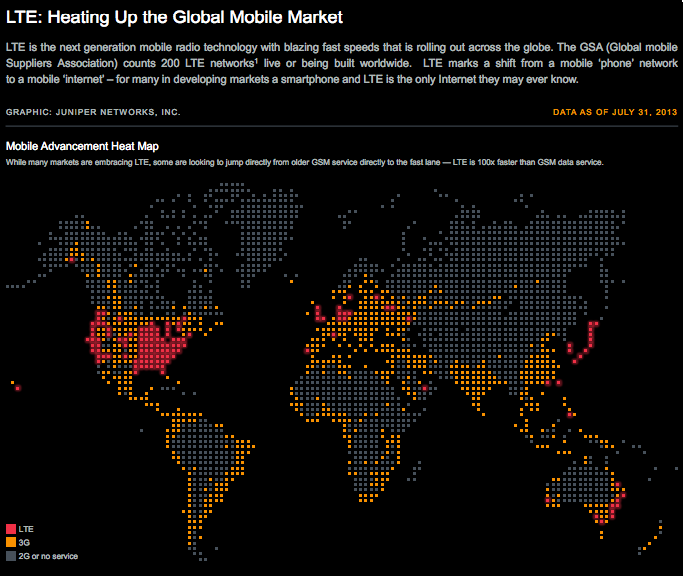 Geographically LTE still only touches a tiny fraction of the world. Juniper Networks(s jnpr) has prepared a heat map of all of the live LTE networks currently running, and as you can see for yourself there’s not much red on this map. The U.S. is responsible for much of that coverage with most cities east of the Mississippi River and on the Pacific coast in at least one U.S. carrier’s 4G footprint. Japan and South Korea are responsible much of the world’s global LTE growth, but the two count for relatively little landmass. Otherwise we’re looking at patches of red in Europe, Australia and Canada as a few splotches here or there in Asia and the Middle East. What might be even more surprising is that Juniper’s map shows that 3G actually covers relatively little of the globes’ land mass though it does capture the majority of the world’s population. Most of Canada, Russia and Australia as well as the interiors of South America, Africa and Asia either have 2G network or no networks at that all. That’s not unreasonable, considering relatively little of the world’s population live in these areas (with the exception of Africa). But it’s still interesting to note that in most places in the world it’s still impossible to get a decent mobile data connection. Juniper also crunched the numbers on LTE connections, and as you might expect penetration is high in the U.S. and Japan where the first large-scale rollouts occurred in late 2010. After three years, though, the U.S. not only trails Japan in penetration, it’s behind South Korea and Australia as well. 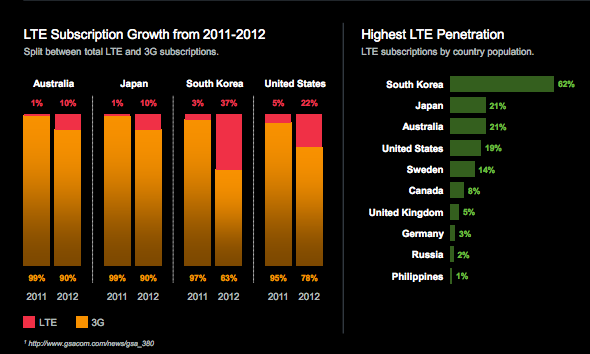 What’s even more remarkable is how quickly Korea embraced LTE. According to Juniper’s figures, 62 percent of Korean the population has an LTE device, compared to just 19 percent in the U.S.
90% of Canada’s population lives within 100 miles of the U.S. border and there is LTE across a significant portion of that. Most of the other gray areas would still be gray in 100 years as nobody lives out there. Did you say Asia has little of world’s population? Singapore definitely has 4G access. Granted its so small it could get missed since it is probably smaller than a single dot on the map. But I am 95% sure that Malaysia or at least greater Klang Valley has LTE access via YES network who heavily promotes their 4G huddles and 4G Samsung Chromebooks. They probably should have spent some more researching this and they also could have used a more accurate map representation regardless of how popular these dot maps are currently. Puerto Rico has most of the island covered with LTE from all four cellular providers: AT&T, Claro, Sprint and OpenMobile. Yet this map doesn’t even show us having 3G service, let alone LTE. South Africa has LTE coverage in all major cities yet this map give one the impression that even 3G is scarce.